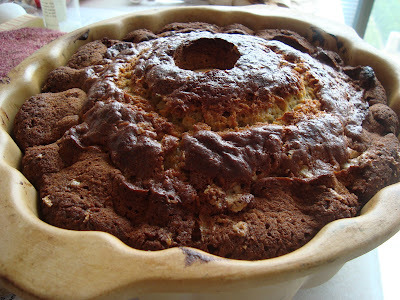 Dorie's recipe for a banana bundt cake is pretty straight forward and is similar to recipes I've made in the past. It's a classic after all! For this recipe, a batter is made with the usual suspects - flour, baking soda, salt, butter, sugar, vanilla extract, eggs, ripe bananas and sour cream or yogurt. I had just enough plain Greek yogurt left in my fridge so I used that instead of sour cream or plain yogurt. The cake is baked for an hour or so, then allowed to cool. Dorie suggested to wrap the cooled cake and allow it to sit on the counter overnight... because it's better the next day. It was hard to resist the temptation of waiting, however I had to find a distraction. The original recipe suggests making a lemony white icing for the cake, but I've always been fond of banana cake with cream cheese frosting so I made that instead. Deliciously paired and a great recipe overall! Thanks Dorie! Cream cheese frosting is an excellent idea! Your cake looks lovely. 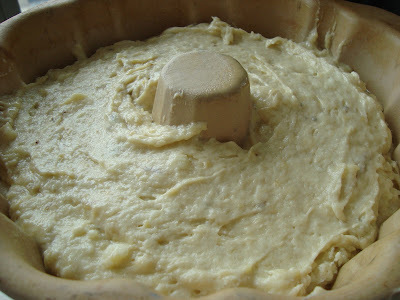 Now I can't decide whether to make this cake or the banana coconut muffins...I may have to get some more bananas! I love how you iced the cake! It looks so pretty! That frosting looks amazing! It's so convenient that bananas freeze so well, I always buy too many. 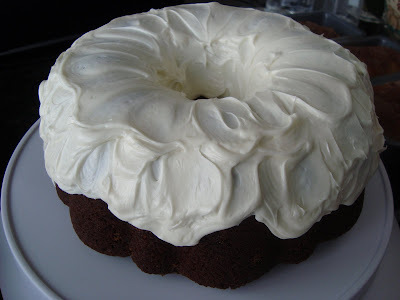 I loved the banana bundt cake, and you just took it a level above with the cream cheese frosting! Yummy!